My New Favorite Hair Product (Plus an OOTD)!!! Confession: I have curly, frizzy, and at times...UNRULY hair. As a child, I had legit ringlets & Mom would just wash my hair, let it air dry, and it would not frizz!! I don't know what happened between then and now, but I have tried literally COUNTLESS products after I wash my hair to try to control the frizz. A curling iron has always tamed it and is usually how I smoothed it, but I could never wear it straight without frizz. Three weeks ago I was getting my hair done (goodbye dark roots, hello blonde) & the best hairdresser in the world (seriously she gave me my first haircut when I was in the 3rd grade. I love her!) told me about a new hair product called "Crack"....yes, you read that right. Crack. I know, I know, it's a pretty funny name but the results that this product give are out of this world!! If you're like me and have frizzy hair, you HAVE to try this product. I have pretty thick hair so I use quite a bit (probably about 2 big drops) and rub it between my palms so it has a smooth appearance. I evenly distribute it through my hair right after I get out of the shower, and blow dry it with my brush. I then straighten it with my Chi straightener and there is no frizz. It's really my hair miracle!!! Of course I had to include an OOTD with straight hair!! The look below is definitely a go-to look for a warm summer day with a sundress and sandals!!! So what are your go-to favorite hair products?! Leave me a comment and let me know!!! 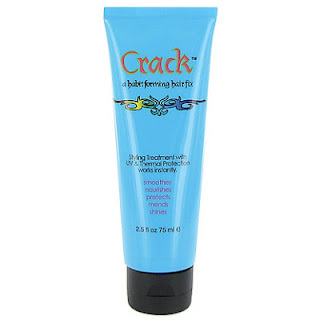 Oh, and check out Crack HERE!!! Thanks so much for reading dolls!!! I am going to have to try this porduct out! i am always looking for great hair products since i have curly hair. I love that shade of green on you and those sandles are oh so cute!! I am so jealous of your tan!! You look great! That green is perfect for you! You look really gorgeous with your green dress! I love love love your necklace so much! Great combination! You are too kind!!! :) Thank you so much girl!!! Thank you so much girl!! :) You have great style!